I know as well as you do that teachers work extremely hard during the school year. We spend whole days on our feet doing our best to explain new concepts to our students. And just because the school day ends, doesn't mean our day is over. Afternoons and evenings are spent grading papers and projects, cleaning up, and prepping for the next day. Even our weekends are busy with lesson plans and center preparations. While all this work can be pleasant, it is also physically tiring. Of course, teaching is emotionally tiring as well. We deal with discipline problems and help children with the emotional issues they bring from home. We give of ourselves to our students every day. 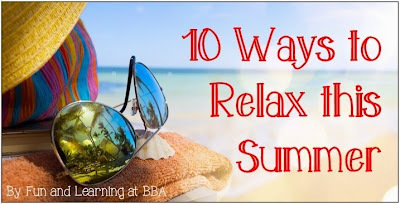 The tiredness that we feel at the end of the school year is exactly why teachers need the summer off to relax. Relaxing is easier said than done though. 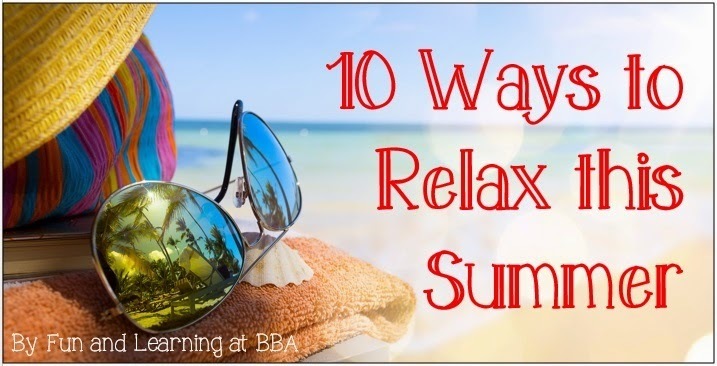 Here are 10 fun ways to relax this summer! 1. Take a walk - Get your blood flowing and your energy up by taking a walk. It doesn't have to be long or fast. A simple stroll around the neighborhood can be an exercise in relaxation. 2. Read a book for fun - We encourage our students to read during the summer. Shouldn't we do the same? Spend some time reading a book that has been on your To Be Read list for a while. 3. Sit in the sun - Summer is finally here! You have been inside your classroom for hours on end for the past months. Put on some suntan lotion and just sit outside for even a short amount of time. You won't be disappointed. 4. See a movie - Now is the perfect time to go see a movie. After all, you may be able to stay up past 9 on a Friday night during the summer. Go with a special someone, a group of friends, or even alone. Just make sure you relax and enjoy yourself! 5. Go out with friends - Speaking of friends, make a date to spend some quality time with your close friends this summer. Plan a spa day, a pedicure, a dinner out, or even a fun night in. Spending time laughing and talking with friends is a great way to relax and unwind. 6. Try some yoga - While the thought of doing yoga may seem overwhelming to some of us, it is also very relaxing. Find a yoga video that's at your level (doyouyoga has a fun 30 day yoga program on youtube), put on some soft music, and try a few poses. You will be surprised at how relaxed you feel afterward. 7. Make a thankful list -Sometimes simply remembering everything we have to be thankful for can be a wonderful relaxation tool. Use a pretty piece of paper to list things that you are thankful for. You can even post the list in a visible spot and keep adding to it throughout the summer. 8. Play a game - It doesn't matter if you prefer board games or sports, playing a game can give you another opportunity to relax. Focusing on a game will take your mind off your to-do lists and worries. Instead you will be focusing on the fun you are having! 9. Call a friend - You have at least a little extra time during the days now. Use that time to chat with a friend that you may not have gotten to talk to lately. While you are talking, try to focus on the positive things that have been happening in your life. Just remember, as teachers we all need some down time this summer. Plan to take some time to relax. Schedule some relaxing activities if you need to. By taking some time to relax, you are more likely to start next school year on a happier note! Relaxing can be HARD! The first few days of vacation always feel uncomfortable, because I feel like I need to be doing something school-related. Thanks for the reminder to recharge. Have a great long weekend!